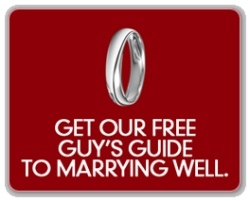 Boundless Line’s book the Guy’s Guide to Marrying Well is available as a free download in pdf format. With many young men not having a good marriage model in their upbringing it can sometimes be difficult to get good advice on how to prepare for a good marriage. This book is not just for those near marriage though, as it covers preparing yourself even before you have met your future wife. The simple purpose of the information here is to present a path that is as biblical as possible in order to help you marry well. But not just so that you can experience all the happiness, health and wealth that guys who marry well enjoy, but so that your marriage can point to God’s glory and His greater purposes. This guide is based on a few timeless concepts — intentionality, purity, Christian compatibility and community — that we rarely encounter in popular culture but are a proven path to marrying well. I want to marry well in the name of Christ.